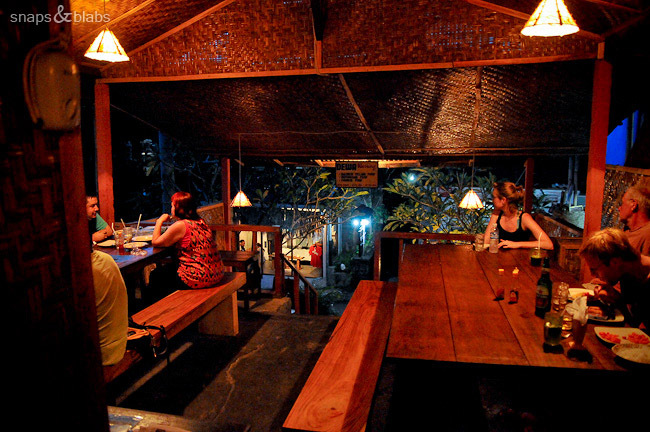 For those on a regular holiday with money to spare, Ubud has on offer a plethora of cafes, restaurants and bars. Big, small, fancy, comfy, loud and romantic, whatever your heart desires its there, or so it seems to those of us on a strict starve-the-monk budget. My sharp researching skills and luck in getting a smidgen of internet lead us to what became our place in Ubud. 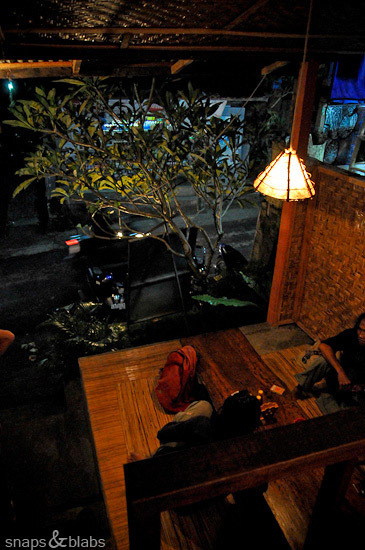 Hidden in a dark street off Dewi Sita (road running between Monkey Forest and Hanoman) is the most unpretentious, yet surprisingly comforting warung offering a few floor sitting tables and two big sharing ones with benches. The walls and ceiling are covered in weaved bamboo and fans are the only cooling relief on offer. We prefer to lounge on floors, so we did just that whenever possible. We like it so much, we made a firm decision to chop off the legs of our solid wood table when we have a home again. What is there not to like about this setup? 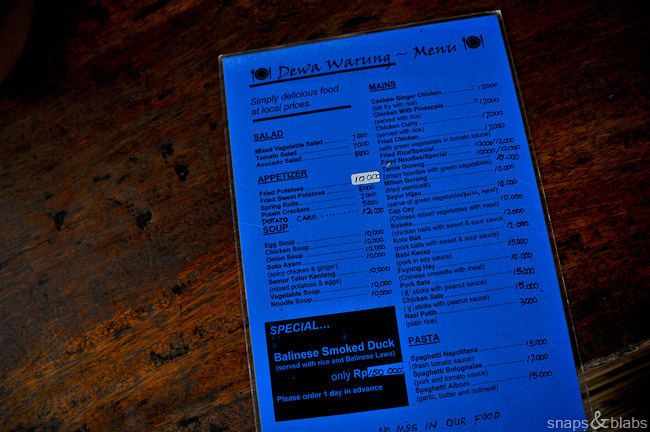 The atmosphere is important, but its the food that people come for and what does Dewa Warung has to offer to its hungry penny pinching patrons? They have a down to business, short and sweet menu with just enough choice for everybody. The wait for food is never too long and always long enough so you know the food is being prepared now, not yesterday and remodeled as you sip your drinks, and it always arrives hot. Big crisp spring rolls, which never cool down fast enough for us to eat..
..and actually have veggies inside, instead of that floury mush stuffing found in a lot of the cheap options. And one of the absolute, hands down we eat it every single time offerings: Tofu Curry. 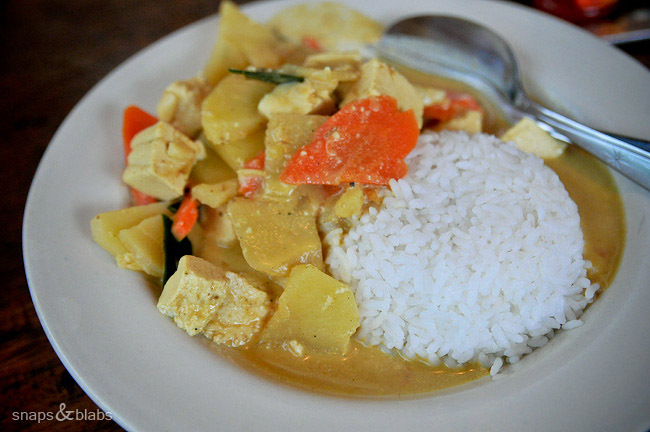 A delightful, mellow, yet spicy amalgamation of coconut milk and soft tofu, served with rice. There is always plenty of sauce left, so do offer extra plain rice and get even more food. So there is atmosphere, hot yummy food there, but WAIT, there is more. It will leave not only your stomachs, but your pockets full too. For five of us, after four visits, some involving beer and a bit of hyper ordering, we never paid more than $8 total. Need I say more. I didnt think so. 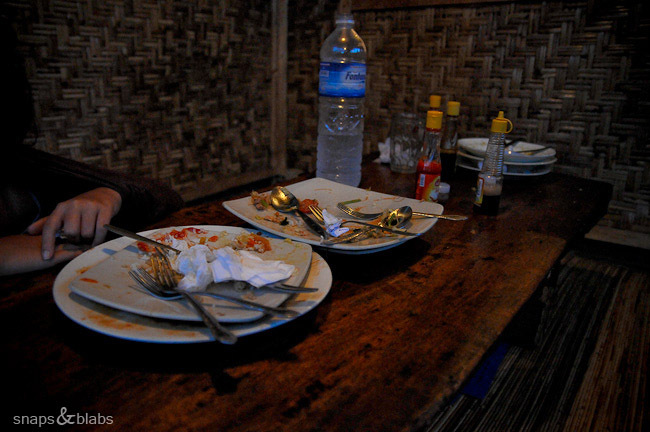 Right there, in the middle of Ubud one can still eat simple, but delicious food, for next to nothing. 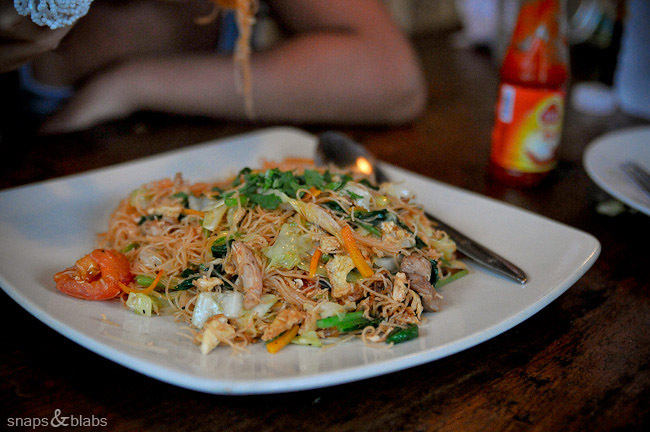 yum–wish we had found this place when we were there–didn’t really find ‘our’ place to eat in Ubud among all the clutter! great post and blog! and yes, we love the low tables too–after our last trip, we had sworn to do the same, but alas, when you get home…it’s somehow not the same! 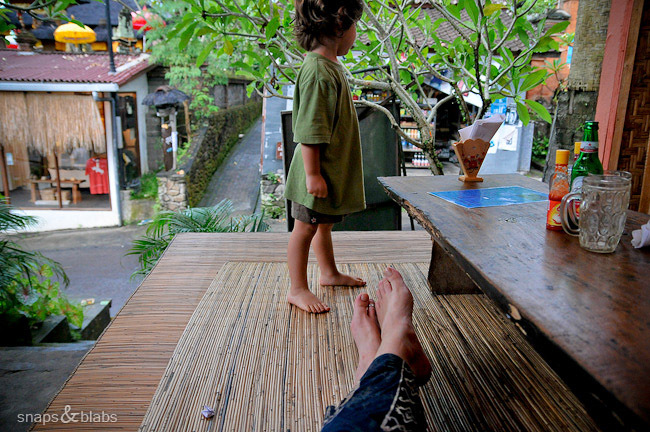 Yes, the clutter..I am meaning to write about our visit in Ubud, but it just hasnt happened yet. Not much to say really. I am a bit unsure we will get the guts to chop that lovely heavy solid wood table, but one never knows. I hope we do, because eating on the floor makes food taste at least twice as nice. 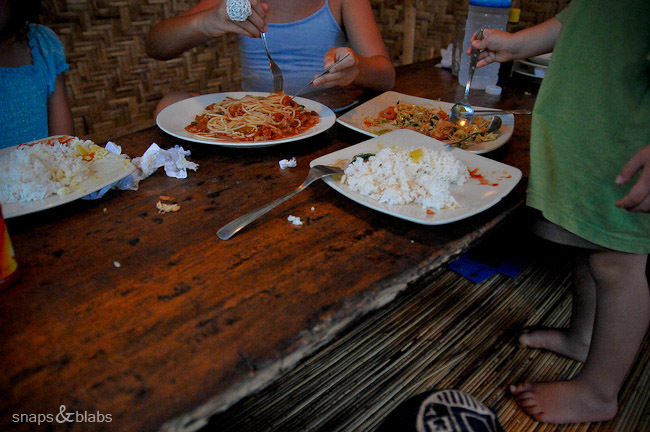 I am very impressed at how your kids eat such a variety of different foods! My daughter isnt a picky eater in the least, but your kids put her to shame! The food looks YUM – thanks for sharing! Beth, they do eat a variety of foods, but dont worry, I have my picky child – Little B. She can eat raw salmon, capers, olives, all the fresh fruits and veggies in the world, but is very particular about everything else. She has been improving on this trip though. When the choice is between being hungry and putting up with that weird looking brown spot on your spoon, things change. Now that is seriously my kind of food, lol. Looks a lot like Thai food (the coconut milk dish) and a filipino dish I’ve had. Yummmmm! 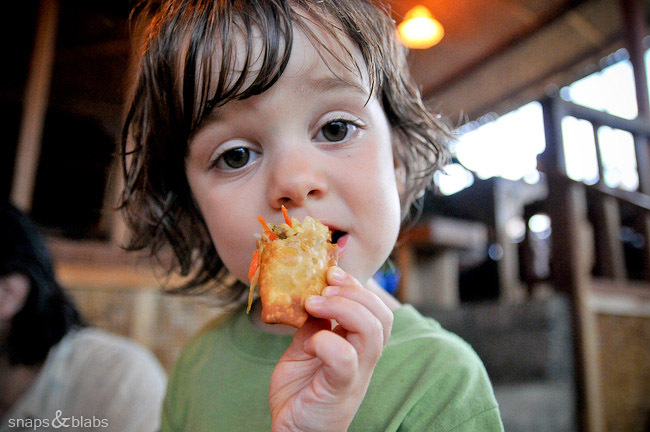 it has been for years and the time when that place still was on Jalan Sugriwa the place to eat authentic balinese food in Ubud, a place where you can find Tempeh with saus tomato and fern, and the best cap cay in town. And where even the locals comes to pick up dinner. And Dewa, the always sweet and now a little bit tired owner is a great person. 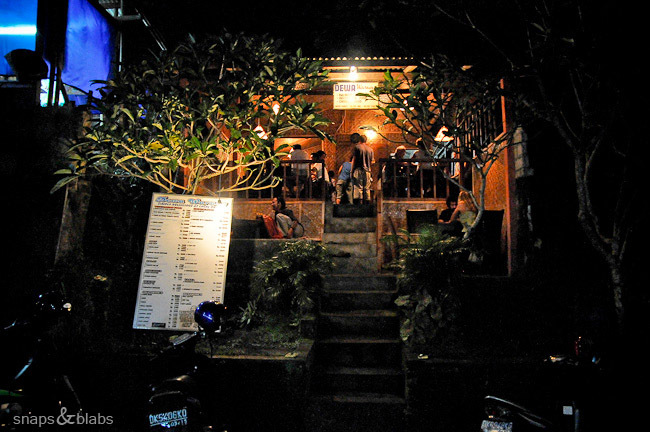 Im happy that this place still exist in the hustle of nowadays Ubud! 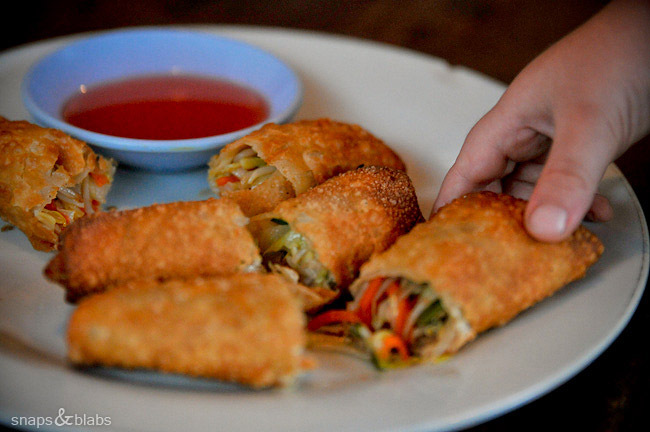 Those with floury mushy stuffing is a different species, it’s called risoles in Indonesia (Dutch influence), while spring rolls is “lumpia.” So it’s not because they’re the cheaper version. Agree on the nice setting, been there once myself.